Tulsa leads the pack in the Mountain Division and Western Conference; hosts Wichita Tuesday before embarking on longest road trip. 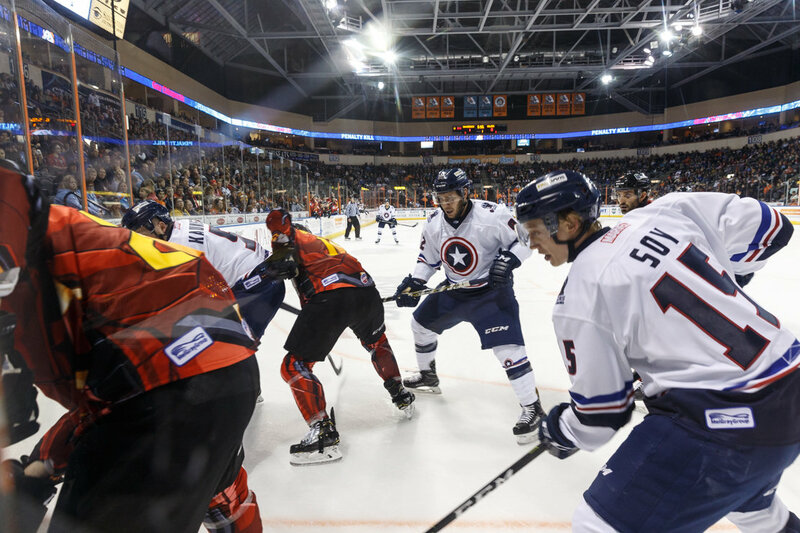 >> The Tulsa Oilers returned to the ice after posting a 4-0-0 record during Thanksgiving week and extended their winning streak to five games with a 3-2 win Tuesday over Allen. Kyle Rhodes put Tulsa in front 7:54 into the game as the Oilers led 1-0 after one. The two teams exchanged a pair of goals each in the middle frame, as Tulsa was never able to gain a two-goal advantage and Allen never led. Jared Thomas scored a power play goal after the Americans tied the game to put the Oilers back ahead 2-1. Then after Allen evened the score a second time, Scott Henegar provided the game-winner with 5:24 left in the period. Evan Fitzpatrick turned away all 12 Allen shots in the third to help preserve the victory. >> Defenseman Steven Kaunisto gave the Oilers all they would need Saturday with a shot through a screen that rang off the post and into the net 8:39 into the first period at Silverstein Eye Centers Arena. Devin Williams would do the rest, stopping all 27 Kansas City Mavericks shots in a 1-0 shutout win. It was the first time the Mavericks had been beaten on their home ice (7-1-0) this season, and vaulted the Oilers into first place in the entire ECHL with 30 points. >> Saturday’s rematch in Independence was quite the opposite of Friday’s 1-0 final. Kansas City jumped out to a 3-0 first period lead, and although Ryan Tesink scored in the second period for Tulsa, the Mavericks answered before the end of the middle frame to lead 4-1 entering the third. Cue the Oilers comeback. Tesink added his second goal early in the final frame to make it 4-2, and Dylan Bredo brought the Oilers to within one. Tesink completed his first professional hat trick with 4:59 left in regulation to bring the Oilers all the way back to 4-4 in a game that looked destined for overtime. But Kansas City capitalized with a late go-ahead goal off of a Tulsa turnover with 2:15 left to spoil the comeback effort, and added an empty net goal late to win 6-4 in regulation. Devin Williams’ 27-save shutout Friday was his first of the season and fifth of his career. Steven Kaunisto had three game-winning goals in the month of November. Ryan Tesink completed a hat trick Saturday for the first time in his pro career. The Oilers six-game winning streak (11/20 – 11/30) was the team’s longest since October 2016. Before last Tuesday, the Oilers hadn’t led its division since Dec. 8, 2016. Tulsa embarks on its longest road trip of the season, with 6 games in 8 days starting Friday. The Oilers’ 1-0 win Friday against Kansas City was the first time in the history of rivalry, spanning 90 games, that Tulsa had shutout the Mavericks…Tulsa had won five consecutive road games dating back to Nov. 7 before Saturday’s 6-4 loss…The Oilers return home Tuesday where they have won four straight at the BOK Center…Tulsa welcomes the Wichita Thunder to the BOK Center for the fourth time already this season Tuesday. Including the teams’ preseason exhibition game, the Oilers have won six straight games over Wichita in the StoneWolf Casino Cup series, dating back to last season. Tulsa leads the 2018-19 season series 4-0-0 so far.